The Palace on Wheels was the first of four luxury trains of Indian Railways. It was launched to promote tourism in Rajasthan and has been highly popular since its launch. It is one of the top twenty luxury trains in the world. The concept of the Palace on Wheels was derived from the royal coaches of the erstwhile rulers of the princely states of Rajputana, Gujarat, the Nizam of Hyderabad and the Viceroy of British India. The original Palace on Wheels consisted of the personal carriages of these rulers of India, but the current refurbished cabins of the train are the replicas of the original carriages that are technologically advanced. The cabins have been christened after the princely states of Rajasthan. The train has 14 saloons , all named after the different Rajasthan provinces like , Jaipur, Jaisalmer, Jodhpur etc. All saloons are equipped with Channel Music, Intercom, Mini Pantry, attached bathroom and a personal attendant. The train includes two restaurants, each possessing a stylish décor. The guests aboard can savor sumptuous food of Indian and other popular world cuisine ,such as Continental and European. These restaurants also have in- house bars, serving a variety of, alcoholic and non- alcoholic beverages of both Indian and International brands. A spa and a sitting lounge are also part of the train. The Palace on wheels takes a seven night journey through the major heritage locations of Rajasthan and Agra, the home to TAJ MAHAL. October to March is the prime season to take this exquisite journey and feel like royalty. Suffused with nostalgia and drenched in luxury, Maharajas Express rail tours transport you back into an era of elegant traveling reminiscent of the romance of Indian Maharajas. The train is considered to be the India’s answer to the Orient Express of the West. Flagged off in 2010, Maharajas Express offers 5 pan-Indian itineraries crisscrossing across some of the most fascinating terrains in India and covering some of the most prominent tourist destinations across country. Maharajas Express can carry a total of 84 passengers in elegantly appointed cabins which include a lavish presidential suite spanning over an entire carriage. There are 2 restaurants, a lounge bar equipped with library and souvenir shop to indulge the guests during their journeys. 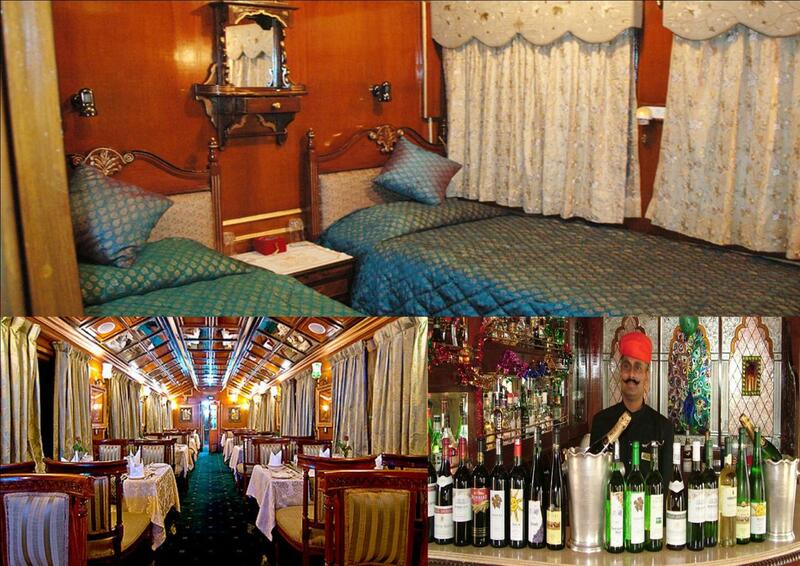 Maharajas Express comprises of 14 guest carriages. There are 20 Deluxe Cabins, 18 Junior Suites, 4 Suites and a plush Presidential Suite offering elegant living comparable to a 5 star hotel. Some of the amenities that set Maharaja Express apart are the Wi-Fi internet, LCD TVs and direct dial phones in each cabin. Besides, spacious en-suite bathrooms with showers, private butler and 24×7 room service ensure that your journey never fall short of the high standards set by the train. Gourmet dining on board the maharaja train is arranged in 2 dining cars which are named Rang Mahal (Color Palace) and Mayur Mahal (Peacock Palace). The plates are fine Limoges, edged with gold, the glasses Swarovski hand-cut crystal and the cutlery monogrammed with the letter M. Variety of cuisine are served on board. 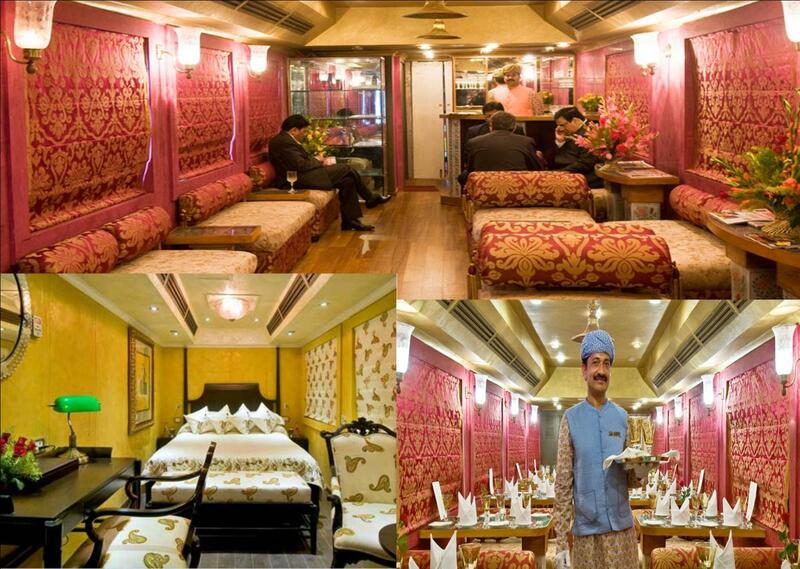 Impeccable interiors and gracious hospitality ensures that you get to dine like a royalty on board Maharajas Express. 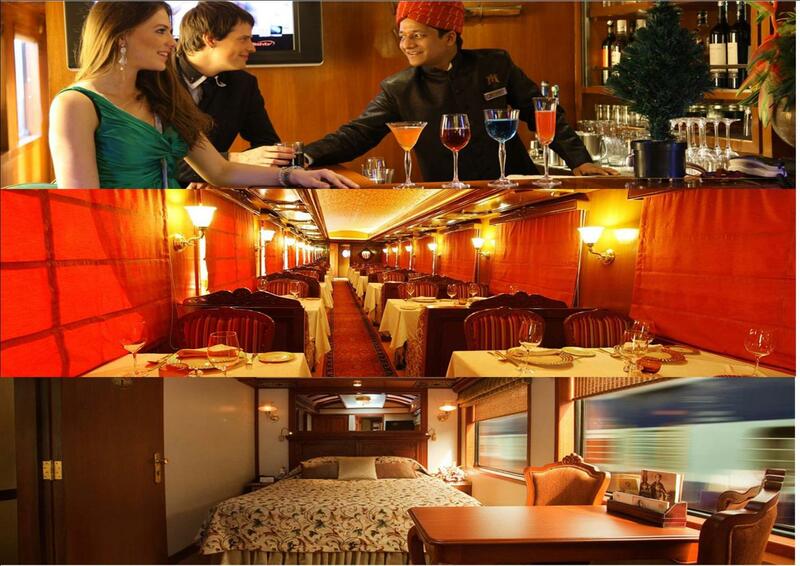 Guests could engage in recreational activities inside the Rajah Club – Lounge Car. Rajah Club has a well stocked library with general books and pictorial guidebooks offering glimpses of Indian Maharajas who used rule their kingdom before India became democracy. Board games and card games could also be enjoyed in Rajah Club over sip of your favorite wine. At one end stands the bar and at the other stands a souvenir shop named Treasure Chest from where you could buy mementos of this royal train journey. The winter months of October to March are is the ideal for a royal journey on board Maharajas Express. ContactRoad2Travel for more.. This Indian luxury train comes equipped with state of the art amenities such as air conditioning, Wi-Fi internet, live television, wardrobe, vanity desk and en-suite washrooms having 5 star accessories. The total 44 Air Conditioned cabins in 11 inter-connected saloons are combination of 26 Twin Bedded Cabins,17 Double bedded Cabins & One Cabin for Physically Challenged. The train also comes with 2 dining cars, a bar & a lounge and fitness center and spa. The 19 coaches on the train are colored purple and gold, and sport the logo of a mythological animal with the head of an elephant and a body of a lion . With interior decor inspired from the Hoyasala and Mysore tradition of architecture, this luxury train transports the guest into a bygone era of elegant train traveling. The Golden Chariot offers 2 tastefully crafted luxury train tours in South India. An adventure in comfort, a romance on rail tracks, with heritage & cultural destinations waiting for you to discover them. Very unique, customized itineraries have been developed that leave a resonance of the amalgam of culture of South India. World Heritage sites, Temples, palaces, relaxed beaches, a wildlife sanctuary, backwaters, there is something for everyone. Embark on a voyage through the sand of times as you travel in style aboard this luxury train in South India. October to March is the running season for this train and you may contact Road2Travel for more.. Pack your bags and get all set to experience and witness the grandeur of the erstwhile Maratha Kingdom by going on-board another of India’s luxury trains, Deccan Odyssey. A journey aboard Deccan Odyssey-The Blue Limousine on Rolling Wheels- is a superlative experience, with 10 meticulously designed itineraries at the disposal of tourists. Where else would you find a UNESCO World Heritage Site, an excellent vineyard, a palatial residence, lions & tigers basking in the glory of sun, sun-kissed beaches, tranquil backwaters and the holy abode of Sai Baba …… Each of the aforementioned destinations is traversed by this luxury tourist train. The luxury train journey aboard Deccan Odyssey is one of the most exciting and grand ways marked by sheer opulence and pomp. All the 10 journeys speak volumes about the ancient architecture, royal living and religious destinations among others. Deccan Odyssey comprises of 21 luxuriously appointed coaches. Out of these 21 coaches, 11 are to accommodate guests and the rest are used for different purposes such as dining, lounge, conference car and health spa. Echoing the penchant of the erstwhile Maharajas, all the 11 guest accommodation coaches of Deccan Odyssey is outfitted with cozy furniture and personalized guest amenities. All the cabins are spacious enough where guests can roam freely. The decoration of each coach reflects a particular era of the Deccan milieu and is creatively outfitted with facilities like personal safe, telephone, attached bathroom, air-conditioning and a personal attendant, on the round the clock service of the guests. Complemented by the very best of personal services, traveling on the private cabins of this deluxe rail is a unique rail tour experience in India. The ten thought fully prepared itineraries range from 2N/3D to 7N/8D and the train runs throughout the year on a fixed schedule. For more on schedule, itineraries and prices contact Road2Travel. The luxurious Royal Rajasthan on Wheels takes you through a seven day exploration of the vibrant Rajasthan. The magic of the splendid journey begins at New Delhi and prepares you to weave the fabric of delightful imagination becoming reality over the next seven days. Your royal journey begins from Delhi and takes you through various erstwhile princely states of Rajasthan like Jodhpur, Udaipur, Chittor, Swai-Madhopur, and Jaipur. After experiencing multifaced Rajasthan you will visit Khajuraho temples unique gift to the world and then Varanasi, The holy city and city of temples and ghats,. In the end, The Taj Mahal, at Agra. This journey will come to an end at Delhi. Each of the 13 luxury train cabins of the train has an amazing décor and is adorned with contemporary services and amenities such as channel music, attached bathroom with plush toiletries, in-room safe, Wi-fi connectivity, temperature control remote, upholstery and more. 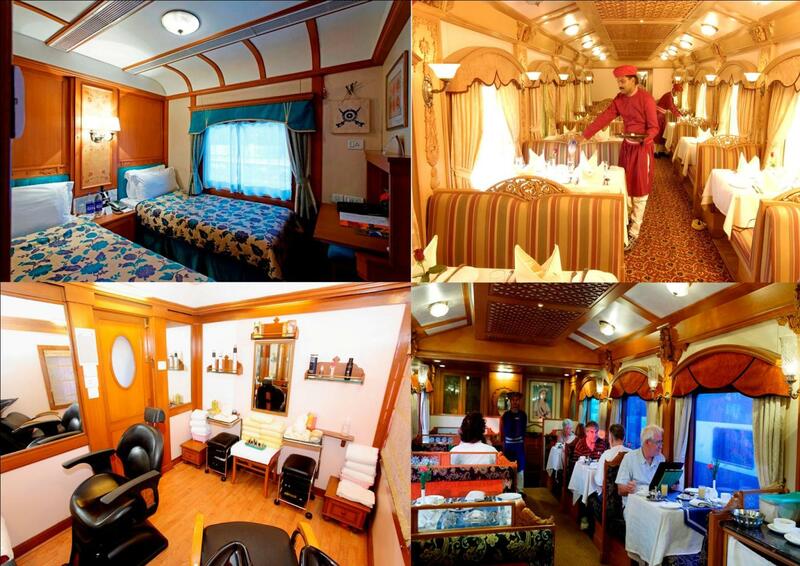 The salons of the Royal Rajasthan on Wheels have been segregated into Bravura Suites and Extraordinary Suites. As the passenger capacity is limited, you can enjoy a comfortable stay while on-board. The train has a common lounge where the guests can interact with each other. This lounge also has Wi-fi connectivity. There is also a Spa aboard the train where the guests can relax their tired senses. Get your hands on some amazing gifts and knick-knacks for the loved-ones back home from the Souvenir shop. The train has two restro bars- Swarn Mahal and Sheesh Mahal, serving cookery delights of Indian and popular world cuisines. You relish dishes of Rajasthani, Indian, Continental and Chinese cuisines. Both the restaurants have a great ambience. Rest assured that the modern amenities on board, gracious hospitality and sumptuous cuisine will leave you pampered, impressed and yet wanting.